This smile was a definite cover up for how Elissa was really feeling before work. This was a more accurate depiction of how she really felt…especially after 8 hours at work. Her lack of fun and exciting entertainment left her bereft and she didn’t do as well as she would have liked to at work. 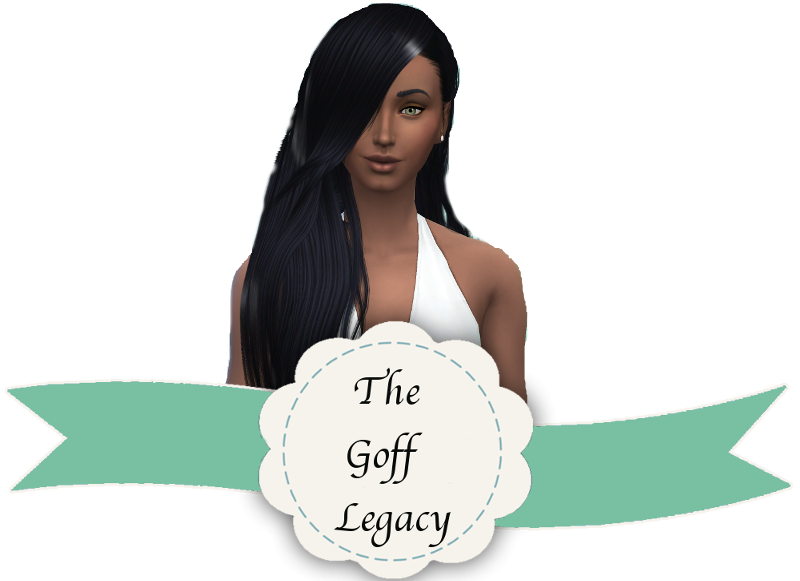 She needed….FUN! But where to? 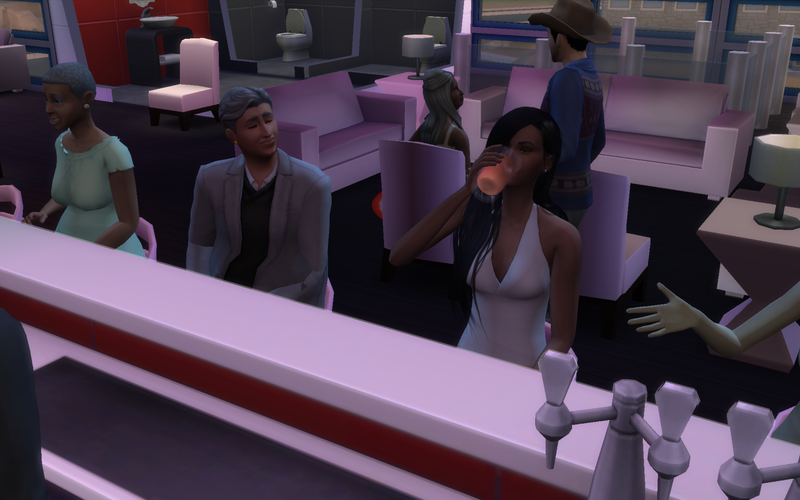 It was a little after 5 and Elissa felt that she could use a drink so she headed to a lounge in the next town over. She made small talk with a couple of the locals, some who were quite the character. Then when the seat next to her became vacant, an older gentleman took up residence and proceeded to discuss how attracted he was to Elissa. It was flattering at first…Elissa hasn’t had much attention from males as of late, but then it became borderline creepy when he began to discuss children and marriage all within 15 minutes. He threw his wealth around as if that would reel Elissa in for sure…it did quite the opposite. It was only so much Elissa could take. She downed the rest of her drink, already growing a tad tipsy from the previous drinks she imbibed, and headed over to a small corner where several people sought to entertain themselves. 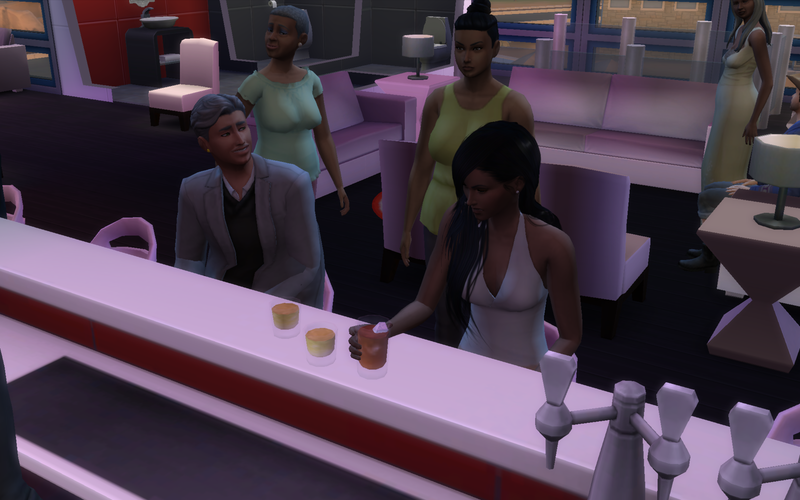 Feeling the mood, Elissa jumped up onto the small stage and cracked joke after joke about the older gentlemen who talked about his simoleons as if they were his last lifeline. The crowd loved it, but not the older bachelor. He stormed out and Elissa could only chuckle to herself. After a few more drinks Elissa figure it was time to go home and it was well into the morning when she did so. She looked at her watch and discovered that she had to go into work…like 15 minutes ago! She splashed some water on her drunken face and headed to work. 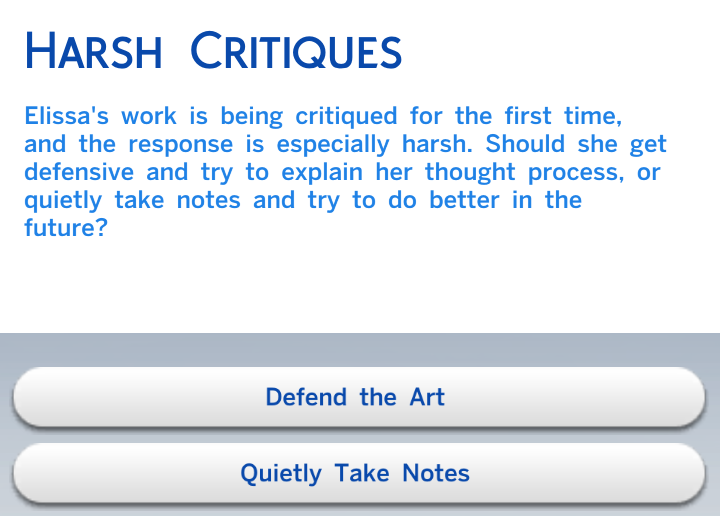 So in a drunken stupor, Elissa was confronted about her work as a painter. On any other normal day, when Elissa had water for dinner instead of Tequila, she would have quietly taken notes. However, today was not a normal day and Elissa defended her art through drunken, and almost incoherent sentences. Elissa was estactic about her performance gain…even if she was still a bit away from earning her next promotion. To celebrate her hard work, Elissa decided to break out into the popular dance “Nae Nae”.